If you’re looking for one of the greatest lunch deals in the entire DC metropolitan area, Proof is undoubtedly the way to go. Rachel and I were figuring out places to go to for lunch last Friday, and we both wanted something that was upscale yet reasonably priced. Proof was able to fulfill both of our requests thanks to their outstanding Lunch Crush special. The deal is only available in the lounge area, but if you can grab a spot by the bar, you’re in for a real treat. Diners have a selection of six entrees in addition to a glass of red or white wine for, you ready, $12! It’s quite an exceptional value, especially when you compare the prices of the entrees alone as opposed to if you were to order them a la carte. Throw in a glass of their house wine and then it becomes a real steal. I ordered the grilled garlic chicken and a glass of the red, an Argentinean Malbec which was very good considering it was only the house wine. Then again, Proof doesn’t mess around with its vino to begin with, but it’s nice to see that they offer customers excellent selections even from their first tier of bottles. 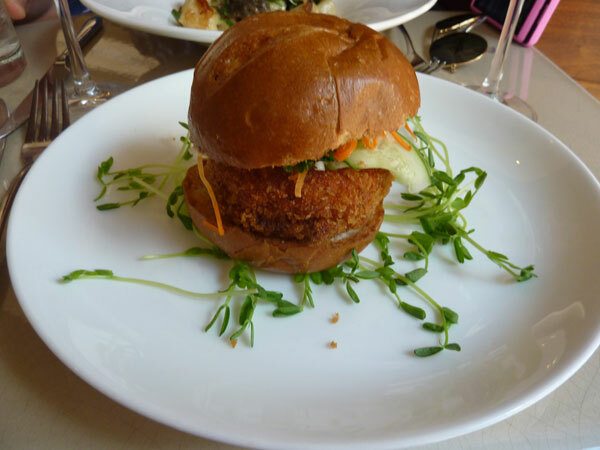 Rachel opted for the shrimp burger, which came with jalapeno, shaved cucumber, cilantro, pickled daikon and carrots. She tried the house white, which turned out to be a sparkling wine and was very different, but in a good way. We were definitely waiting a good amount of time for the food to arrive, especially considering the fact it was the lunch hour, but it didn’t bother us since we had the day off and were not necessarily in a rush. We looked at our watch a few times, but the wine we had was enjoyable while we waited nonetheless. When our food arrived, the server had placed in front of me the sautéed potato gnocchi instead of the chicken. The server then came over and informed that he thought I had ordered the gnocchi, but when I corrected him in saying that I had asked for the chicken, he was very apologetic for the error and said he would have it immediately prepared if I liked. 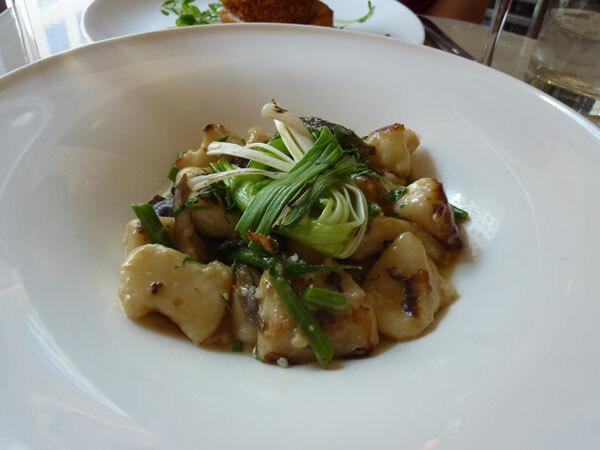 Having read rave reviews about the gnocchi prior to visiting, I was open-minded about the situation and told the waiter not to worry about it and would have what was served instead. Because of the gaffe, the waiter offered Rachel and I another glass of wine compliments of the house, which was a very nice gesture. The waiter did ensure me that the gnocchi was one of his favorite dishes and that I would enjoy it. Well, he was right. It was perhaps the best gnocchi I had ever tasted. I guess I understood why our food took so long to arrive because of how it was meticulously prepared in the kitchen. The homemade dumplings practically melted in my mouth while the wild mushrooms were full of flavor and really added something to the dish as a whole. 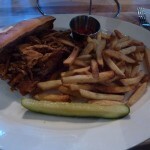 The serving was also very generous and well worth its normal price of $16. 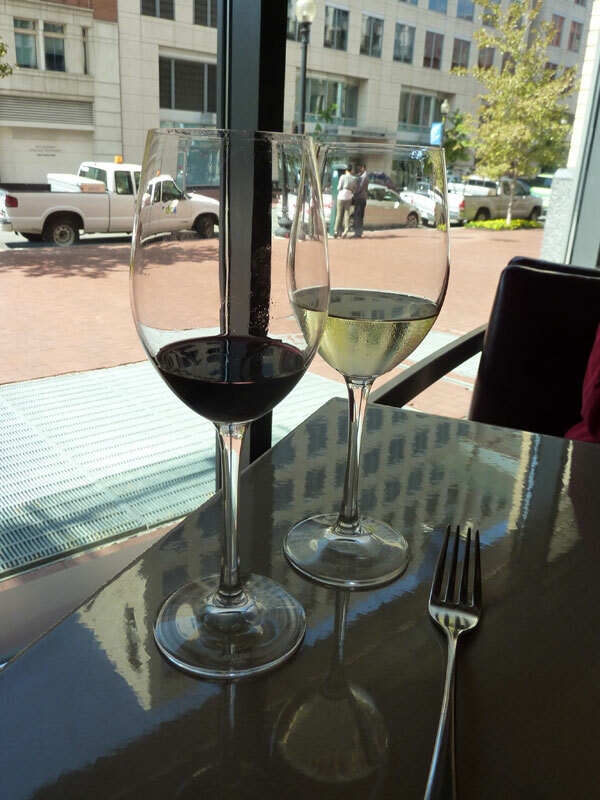 The fact I was enjoying my meal for $4 less and a glass (or two) of wine exemplifies why Lunch Crush is such a true bargain. While there weren’t any sides that came with Rachel’s dish, the shrimp burger itself was very filling, and again, hard to complain about with such a deal. The burger itself was made of all shrimp, almost like a seafood sausage, and was crispy on the outside. It was definitely a different taste, but the combination of the shrimp with the toppings made for an excellent bite. It also had some kick to it but the spice wasn’t too overpowering. When the waiter dropped off our check and thanked us for coming, my jaw nearly hit the table when I read the bill. He not only did not charge us for the additional glasses of wine, but he also only billed us for just one of the Lunch Crush specials. In other words, our bill came out to $12 and tax. I could not believe it. That, my friends, is how to run a restaurant and establish goodwill with your customers. We left him a very generous tip and departed Proof with an abundance of satisfaction to say the least. Between the fantastic meal and an even better customer service, it was pretty much a perfect dining experience.